The Hootens have been singing together for over six years in different capacities. They began singing as a trio made up of Donnie, Ronnie, and Carli Hooten which transitioned after three years into a trio of Donnie, Angela, and Carli Hooten. Now, six years into singing, The Hootens are excited for the opportunity to sing as a quartet and are loving their new sound. 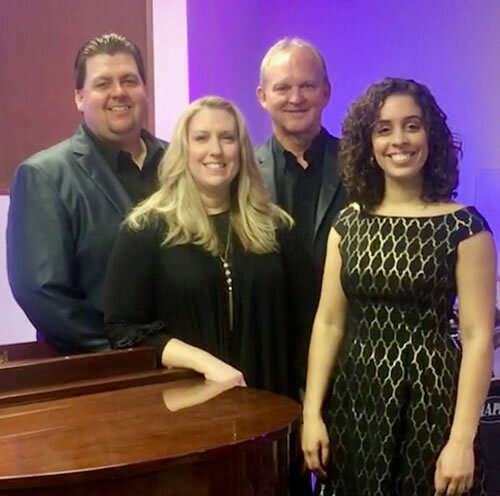 Donnie, Angela, Carli and now Ronnie bring years of vocal experience to this already power-packed ministry, making The Hootens one of the premier gospel ministries in Texas! Donnie and Angela have three children: Carli, Zach, and Eli. Carli sings with the group while studying mechanical engineering at Louisiana Tech, and Zach and Eli are beginning to take the stage as well. Ronnie Hooten is Donnies uncle. He is married to Lynette, and they have two children who are excellent musicians, Nathaniel and Jeremy. Often, they join The Hootens on stage as part of the live band. The Hootens are thankful for the opportunity to minister through Southern Gospel music, and if you want a quality music ministry with a message of hope, contact The Hootens today!